In the early 1990s, UCT (Universal Coating Technologies) developed a proprietary formulation of Nickel Boron—now called EXO—that delivers an unprecedented balance of hardness and lubricity. Since patenting this innovative Nickel Boron technology, UCT has provided surface engineering solutions for OEMs across many industries with diverse applications. But UCT does more than simply coat metal surfaces: we help our customers’ metal parts achieve unprecedented levels of performance and quality. Our innovative EXO technology is just one means to this end. We also provide surface pretreatment expertise, world-class standards of statistical process controls, and we add tremendous value for our customers through our engineering and metallurgical advice. Today, with a high-capacity Nickel Boron plating line in Florida, UCT can devise the exact coating, thickness, and finishing your parts need to meet your performance objectives. 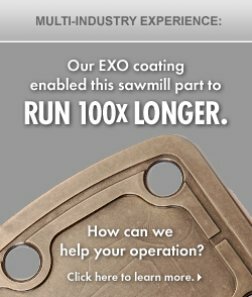 Whether we’re applying our exclusive EXO Nickel Boron coating to your company’s parts, or providing an industry-standard coating, we can coat those parts with a greater precision, uniformity, and consistency than a “job shop.” A roster of quality certifications, governmental and third-party approvals, and end-user endorsements confirms the capabilities of UCT and our products. In short, UCT Coatings has grown from an innovative idea into an innovative surface-engineering company. Whatever the components your company utilizes, we’re ready to help those parts reach a higher level of quality and performance than you may have thought possible.